Did you see Adam Sandler hosting The Late Show for David Letterman last night??? Adam Sandler was scheduled to appear as a guest on Late Show with David Letterman last night. 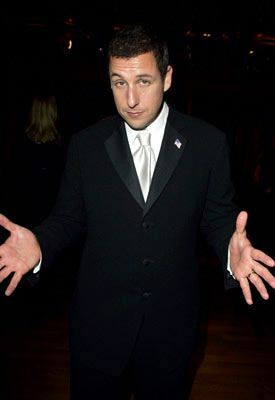 But when Letterman went home sick earlier that day, Sandler was invited to step in as host instead. It was obvious that Sandler wasn’t all that comfortable with the gig, but he made the most of it and was surprisingly fun to watch. Overall, I appreciated Adam Sandler’s humble approach to hosting the ever-popular Late Show. No matter how much one might dream of eventually filling the shoes of David Letterman, having to fill in for him on late notice has got to be nerve-racking. From the opening monologue to Paul Shafer’s impromptu “interview from a distance” of Sandler… the show got off to a slow, somewhat uncomfortable start. 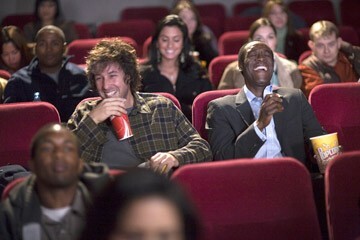 Sandler’s first sit-down interview was with his buddy and fellow actor, Don Cheadle. They had good chemistry. It worked. Danica Patrick was next. My summary: eeh. She’s super stunning to look at, and pretty good at rolling with the punches and Sandler’s awkward questions, but she didn’t add much to the show in my opinion. Then comedian Todd Barry was up, followed by some band. (Update: the musical guest was Lucinda Williams). Both of these closers forced a channel surf on my end. I tend to do that a lot with late night TV in general… if a guest doesn’t capture my attention right from the get-go, I surf and come back for the next guest. The star of the show in my opinion: Adam Sandler’s dog! Yep, Matzo Ball is a female Bulldog, and she sat like a bump on a log on the guest chair through the entire show. Sandler (and the cameraman) would cut to her anytime the show got “weird”. And she added a good bit of comic relief. Three cheers to Adam Sandler for giving it a go, and making the best of an awkward situation. I appreciated the “off the cuff” approach that was fun and fresh… and you never knew what was going to happen next. Word is, tonight’s Late Show was taped (with Letterman as host) on Monday. I don’t know about Thursday and Friday’s shows being pre-taped or not, but Letterman is expected to return as host on Monday. Here’s a great summary of the show (…much more professionally written than mine). Reign Over Me movie opening this Friday! Adam Sandler’s official website …fun stuff. Matzo Ball has her own website …along with brother Meat Ball!